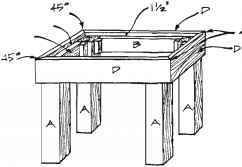 The table top consists of 2 x 6 slats that are mitered at a 45-degree angle on both ends and placed diagonally inside the table trim pieces (D). They are supported by the side supports (B) and the legs (A). 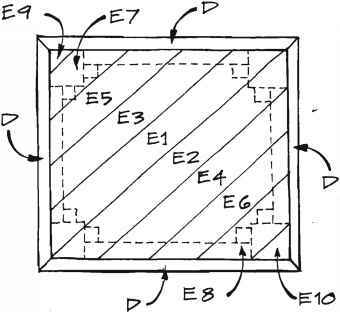 Figure 3 shows the placement of each of the slats. The slats are numbered in the diagram to indicate the order in which they are attached. Setting the first slat on its face, miter one end at a 45-degree angle. Then place the slat so that its long edge fits diagonally across the center of the table top. Mark the length and miter the remaining end of the first slat (E). Continue to cut and miter the nine remaining slats (E), working out to the corners. The last slat (E) in each corner is actually just a small triangle. Fill all of the nail holes, and any cracks and crevices with exterior-grade wood filler. Then sand every surface. 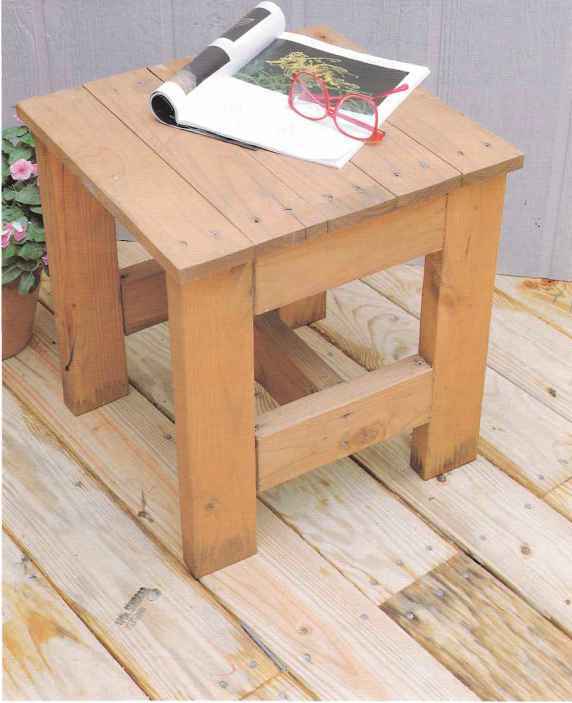 Stain or paint the completed table the color of your choice using exterior-grade finishing materials. After completing our new patio table (see the previous project), I planned to build four seats to go with it. However, now that we have them, we use them not only as seats, but as outdoor cocktail fables and ottomans. We also place them side by side and use lliem as a bench. They are very easy to build, and the cost is next to nothing. These are made from treated pine, but yoo can also use redwood. Just be sure to use waterproof wood glue during the construction.